Background: AquaNew’s Rob Gourley turns 70 years young this month (February 2018). He is part of the Syracuse China legacy being a great grandson of James Pass, an honorary member of Rob’s Inventified Family. 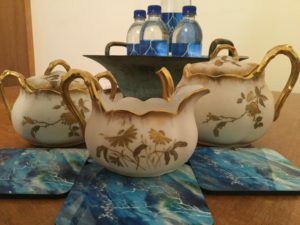 I recall my first introduction to Syracuse China was when Rob’s aunt, Eunice, and I were antique shopping in Anchorage, Alaska during the mid-1990’s. We walked into a shop off 5th Avenue and Eunice’s expression lit up and she walked over to the far side of the shop, to pick up a dinner plate with a brilliantly red poppy flower design on it. It was a must-have and she traveled with the plate back to her home in upper State New York and added it to her Syracuse China collection. Eunice was Rob’s mother, Ann, twin sister and a granddaughter of James Pass. She told me that the earliest china bodies that James made for Syracuse China was the Imperial Geddo design. I have purchased several pieces through the subsequent years of searching on Ebay (see photo above). Rob and I were thrilled when we opened the mailing box, to look at the inside bottom of this small creamer shown in foreground of the photo above and we can see the initials “JP≥L”. It is likely one of James’ experiments in combining the right clay materials and coatings for making fine china in America. I wondered how Syracuse China, under James Pass’ leadership for over twenty years, became so prolific in its many product lines from sturdy china used in railroad dining cars and cruise boats, to fine china used in top-notched restaurants and hotels, to every-day household ware, and to specialty plates designed by well-known artists like the poppy plate that Eunice found in Alaska. Examples of the vast array of everything Syracuse China fills the entire floor of the Onondaga History Museum located in Syracuse, N.Y. In reading about James Pass’ early life, it seemed he had to make his own way. His father was an English-trained potter and immigrated to America. His father was employed by Onondaga Pottery Co. of Geddo, N.Y. (later renamed Syracuse China) and he eventually worked his way up to being President of the company. James began working in the pottery by age 19. He ventured out on his own with a passion to have his own business and continue his porcelain research. His business ventures ultimately were not a success but the experiences of his journey led him to the discovery of how to make America’s first truly vitreous (translucent) china body. Several years after the passing of his father, he was rehired as the President of Syracuse China. His Imperial Geddo pieces won the High Award Medal for translucent china at the 1893 Chicago World’s Fair. This award as well as other distinguished awards that followed, lifted Syracuse China along with James’ creative skill and manufacturing vision, from being a local New York pottery to a major business of worldwide recognition. My husband, Rob, showed me the translucency of the Syracuse fine china. 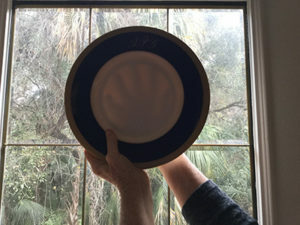 Hold up to the sunlight translucent china and you can see the shadow of your hand looking through the front of the plate. The photo to the right, shows one of the plates from Rob’s parents’ wedding china pattern (Old Ivory Queen Anne) which is similar to one in the White House china collection. On the upper cobalt blue rim, there is a monogram of “APG” (Ann Pass Gourley) and the set was a special run made by Syracuse China for one of the Pass granddaughters (Rob’s mother). Another of Rob’s aunts and a granddaughter of James is Ruth Pass Hancock. She served as an advisor for the book on the history of Syracuse China. BTW, the poppy plate shown on the book cover is the same one that Eunice found with me in an Alaskan antique shop over twenty years ago! About the Photo Above: Syracuse China (formerly Onondaga Pottery Company or O.P.Co.) Flow Blue Plum Setting on a Table Surrounded by Descendants of James Pass along with Their Spouses and Children. The blue plum design with personalized hand-painted gold decoration was made by the employees of Syracuse China for their families and friends only (was not available to purchase on the commercial market). 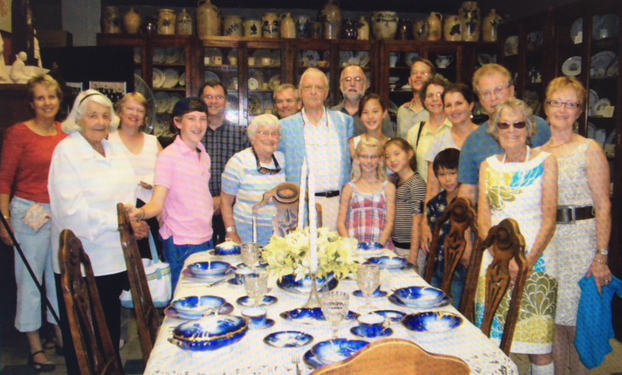 Left to Right: Dana Gourley, Ruth Pass Hancock (granddaughter of James Pass), Carol C., Jeremy S., Tom H. (Museum Curator), Phydele E., David S., Darrell C., Richard C. (great grandson of James Pass), Sierra S., Amelia C., Luna C., Rich C. (great grandson of James Pass), Ruth Ann C. (great granddaughter of James Pass), Amy S. (great granddaughter of James Pass), Emil S., Rob Gourley (great grandson of James Pass), Eunice C. (granddaughter of James Pass), and Rebecca S. (great granddaughter of James Pass). Photo taken by Robin Jane E. at the Onondaga History Museum, Syracuse China Permanent Collection, Syracuse, N.Y., on September 3, 2010. James Pass exemplifies self-confidence and perseverance in excelling in a trade, eventually achieving recognition for all of his efforts. Do you have an Ahh-mazing “AHA!” Discovery to share? CLICK HERE to read all of our past “AHA!” Discoveries. Great article, Dana! I love all your writings here!